"Amerindian language" redirects here. For the proposed language family, see Amerind languages. Indigenous languages of the Americas are spoken by indigenous peoples from Alaska, Nunavut, and Greenland to the southern tip of South America, encompassing the land masses that constitute the Americas. These indigenous languages consist of dozens of distinct language families, as well as many language isolates and unclassified languages. According to UNESCO, most of the indigenous American languages are critically endangered, and many are already extinct. The most widely spoken indigenous language is Southern Quechua, with about 6 to 7 million speakers, primarily in South America. Thousands of languages were spoken by various peoples in North and South America prior to their first contact with Europeans. [dubious – discuss] These encounters occurred between the beginning of the 11th century (with the Nordic settlement of Greenland and failed efforts in Newfoundland and Labrador) and the end of the 15th century (the voyages of Christopher Columbus). Several indigenous cultures of the Americas had also developed their own writing systems, the best known being the Maya script. The indigenous languages of the Americas had widely varying demographics, from the Quechuan languages, Aymara, Guarani, and Nahuatl, which had millions of active speakers, to many languages with only several hundred speakers. 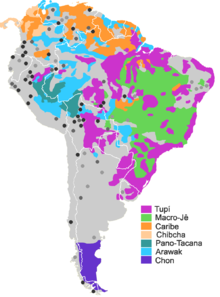 After pre-Columbian times, several indigenous creole languages developed in the Americas, based on European, indigenous and African languages. The European colonizers and their successor states had widely varying attitudes towards Native American languages. In Brazil, friars learned and promoted the Tupi language. 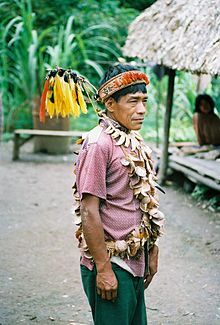 In many Latin American colonies, Spanish missionaries often learned local languages and culture in order to preach to the natives in their own tongue and relate the Christian message to their indigenous religions. In the British American colonies, John Eliot of the Massachusetts Bay Colony translated the Bible into the Massachusett language, also called Wampanoag, or Natick (1661–1663; he published the first Bible printed in North America, the Eliot Indian Bible. In North America and the Arctic region, Greenland in 2009 adopted Kalaallisut as its sole official language. In the United States, the Navajo language is the most spoken Native American language, with more than 200,000 speakers in the Southwestern United States. The US Marine Corps recruited Navajo men, who were established as code talkers during World War II, to transmit secret US military messages. Neither the Germans nor Japanese ever deciphered the Navajo code, which was a code using the Navajo language. Today, governments, universities, and indigenous peoples are continuing to work for the preservation and revitalization of indigenous American languages. In American Indian Languages: The Historical Linguistics of Native America (1997), Lyle Campbell lists several hypotheses for the historical origins of Amerindian languages. Roger Blench (2008) has advocated the theory of multiple migrations along the Pacific coast of peoples from northeastern Asia, who already spoke diverse languages. These proliferated in the New World. Extinct languages or families are indicated by: †. There are approximately 296 spoken (or formerly spoken) indigenous languages north of Mexico, 269 of which are grouped into 29 families (the remaining 27 languages are either isolates or unclassified). The Na-Dené, Algic, and Uto-Aztecan families are the largest in terms of number of languages. Uto-Aztecan has the most speakers (1.95 million) if the languages in Mexico are considered (mostly due to 1.5 million speakers of Nahuatl); Na-Dené comes in second with approximately 200,000 speakers (nearly 180,000 of these are speakers of Navajo), and Algic in third with about 180,000 speakers (mainly Cree and Ojibwe). Na-Dené and Algic have the widest geographic distributions: Algic currently spans from northeastern Canada across much of the continent down to northeastern Mexico (due to later migrations of the Kickapoo) with two outliers in California (Yurok and Wiyot); Na-Dené spans from Alaska and western Canada through Washington, Oregon, and California to the U.S. Southwest and northern Mexico (with one outlier in the Plains). Several families consist of only 2 or 3 languages. Demonstrating genetic relationships has proved difficult due to the great linguistic diversity present in North America. Two large (super-) family proposals, Penutian and Hokan, look particularly promising. However, even after decades of research, a large number of families remain. Another area of considerable diversity appears to have been the Southeastern United States; however, many of these languages became extinct from European contact and as a result they are, for the most part, absent from the historical record. This diversity has influenced the development of linguistic theories and practice in the US. Due to the diversity of languages in North America, it is difficult to make generalizations for the region. Most North American languages have a relatively small number of vowels (i.e. three to five vowels). 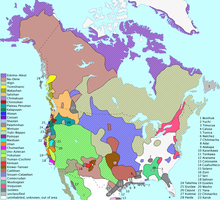 Languages of the western half of North America often have relatively large consonant inventories. The languages of the Pacific Northwest are notable for their complex phonotactics (for example, some languages have words that lack vowels entirely). The languages of the Plateau area have relatively rare pharyngeals and epiglottals (they are otherwise restricted to Afroasiatic languages and the languages of the Caucasus). Ejective consonants are also common in western North America, although they are rare elsewhere (except, again, for the Caucasus region, parts of Africa, and the Mayan family). Head-marking is found in many languages of North America (as well as in Central and South America), but outside of the Americas it is rare. 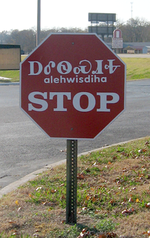 Many languages throughout North America are polysynthetic (Eskimo–Aleut languages are extreme examples), although this is not characteristic of all North American languages (contrary to what was believed by 19th-century linguists). Several families have unique traits, such as the inverse number marking of the Tanoan languages, the lexical affixes of the Wakashan, Salishan and Chimakuan languages, and the unusual verb structure of Na-Dené. It is fair to say that SA and New Guinea are linguistically the poorest documented parts of the world. However, in the early 1960s fairly systematic efforts were launched in Papua New Guinea, and that area – much smaller than SA, to be sure – is in general much better documented than any part of indigenous SA of comparable size. The list of language families, isolates, and unclassified languages below is a rather conservative one based on Campbell (1997). Many of the proposed (and often speculative) groupings of families can be seen in Campbell (1997), Gordon (2005), Kaufman (1990, 1994), Key (1979), Loukotka (1968), and in the Language stock proposals section below. Amerindian linguist Lyle Campbell also assigned different percentage values of probability and confidence for various proposals of macro-families and language relationships, depending on his views of the proposals' strengths. For example, the Germanic language family would receive probability and confidence percentage values of +100% and 100%, respectively. However, if Turkish and Quechua were compared, the probability value might be −95%, while the confidence value might be 95%. [clarification needed] 0% probability or confidence would mean complete uncertainty. Various miscellaneous languages such as pidgins, mixed languages, trade languages, and sign languages are given below in alphabetical order. ^ Greenberg, Joseph (1987). Language in the Americas. Stanford University Press. ISBN 978-0-8047-1315-3. ^ Premm, Hanns J.; Riese, Berthold (1983). Coulmas, Florian; Ehlich, Konrad, eds. Autochthonous American writing systems: The Aztec and Mayan examples. Writing in Focus. Trends in Linguistics: Studies and Monographs. 24. Berlin: Mouton Publishers. pp. 167–169. ISBN 978-90-279-3359-1. Retrieved 15 March 2019. ^ Blench, Roger. (2008) Accounting for the Diversity of Amerindian Languages: Modelling the Settlement of the New World. Paper presented at the Archaeology Research Seminar, RSPAS, Canberra, Australia. ^ If the Caucasus is considered to be a part of Europe, Northwest Caucasian and Northeast Caucasian would be included resulting in five language families within Europe. Other language families, such as the Turkic, Mongolic, Afroasiatic families have entered Europe in later migrations. Mithun, Marianne. (1990). Studies of North American Indian Languages. Annual Review of Anthropology, 19(1): 309–330. Wikimedia Commons has media related to Indigenous languages of the Americas.